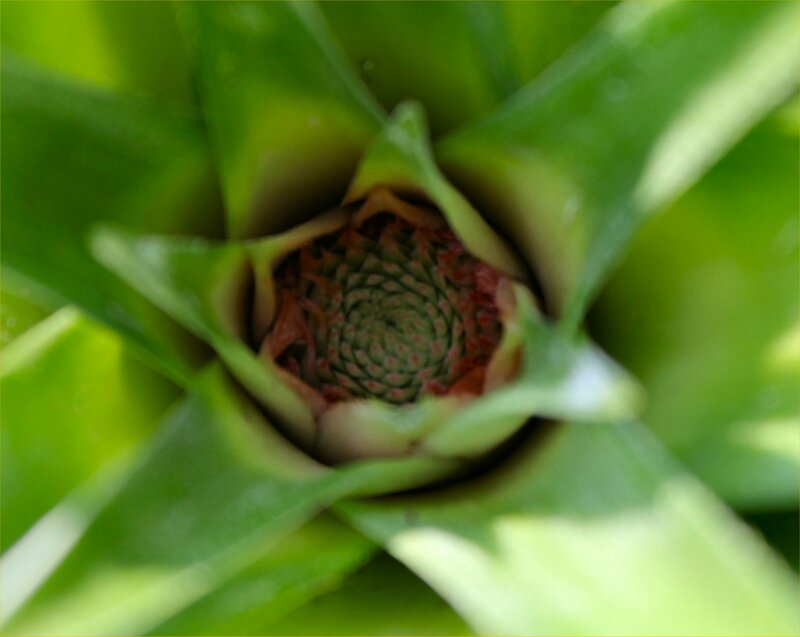 Pineapple Update: Day….Heck, I forget. Our first pineapple, along with the sprouts she spawned. Honestly, I’ve lost track of what week this is in our “sprout to fruit” home-grown pineapple saga. All I know is that it has been a while since I’ve posted an update, and we’ve had significant changes this week. That’s right. 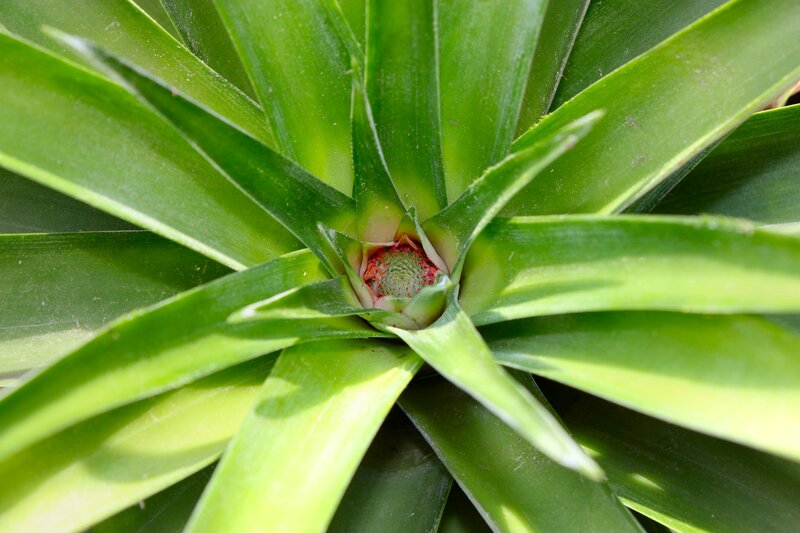 Our baby pineapple is about to fully mature. She’s just starting to take on a yellow hue that indicates she’ll be ripening in the next few weeks. We’re so excited! 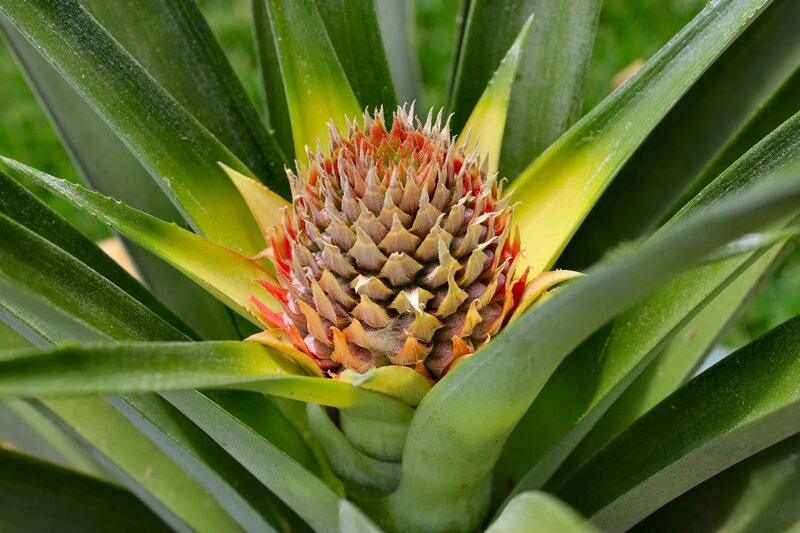 We called the kids and we’re tentatively planning a get together in mid-September to harvest our first pineapple – just in time for Lilly Bug’s second birthday. If you remember, Jonah called “dibs” on the first pineapple. 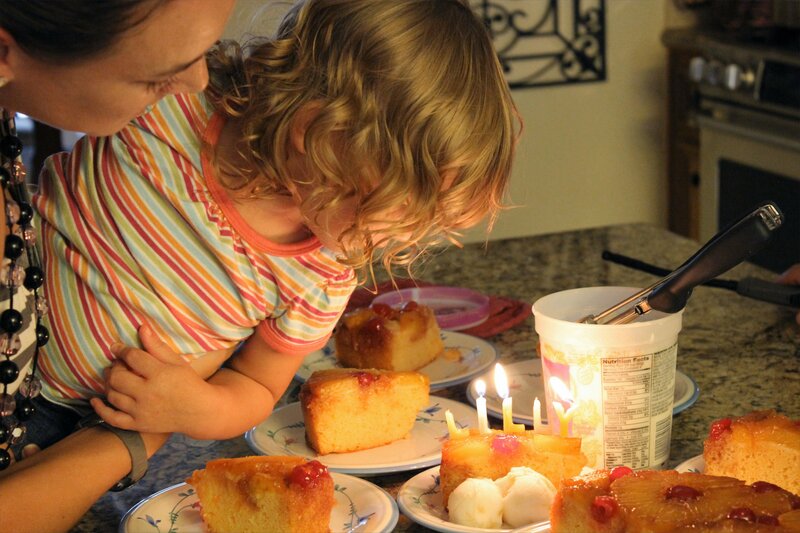 He has his heart set on a pineapple upside-down cake, and he hasn’t let me forget it. That boy has the memory of an elephant. So stay tuned, kids. 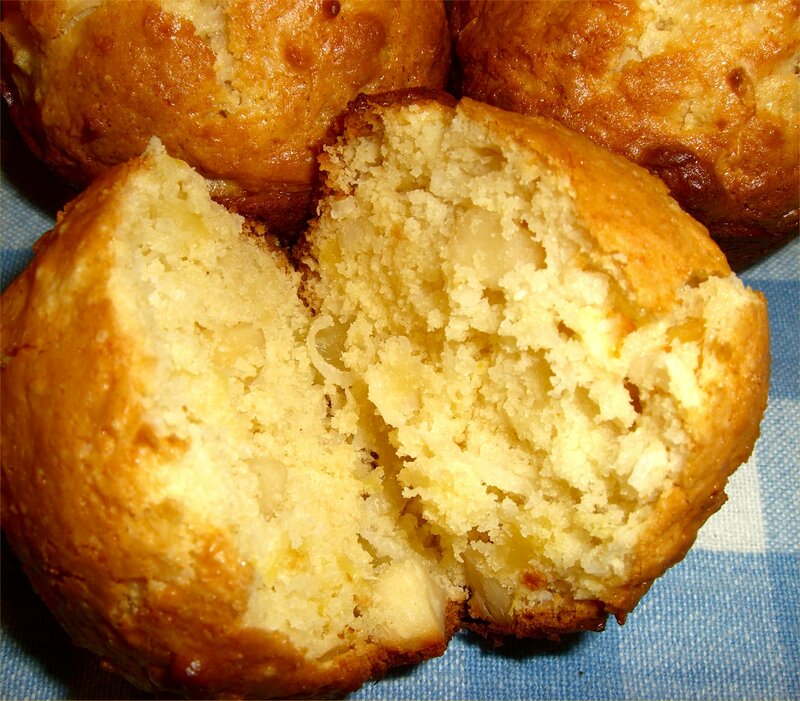 In a few weeks, we may be harvesting and dissecting and baking with the grandbabies. 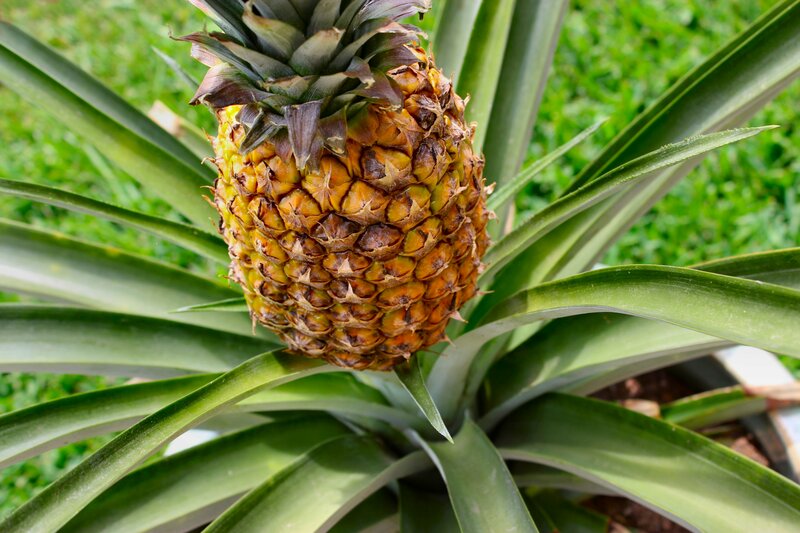 When we do, I promise to snap photos so you can see us celebrating the life and sacrifice of our first ever pineapple. It took us six and a half years to get here, but I have a feeling it’s going to be worth the wait. Just wanted to give you a quick update on the baby pineapple’s progress. It’s Day 25, and I am blown away by how quickly she’s growing. Yes, I said she. 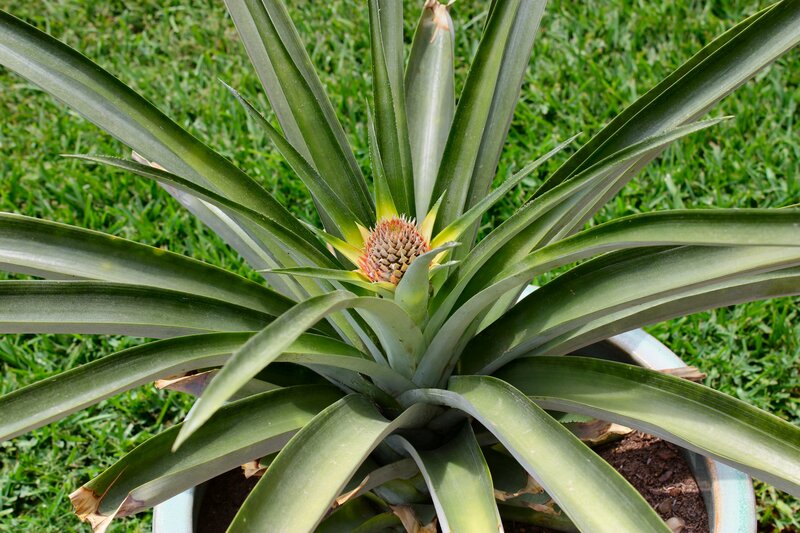 I have decided our first baby pineapple should be classified as a female, since she has the potential to spawn 2 more pineapples after this one, as well as additional plants from the shoots that will be emerging soon. Her name, therefore, shall be La Piña Saparot, a combination of names suggested by readers Toffee Marshmallows from the United Kingdom and Patricia DeWit from Thailand. 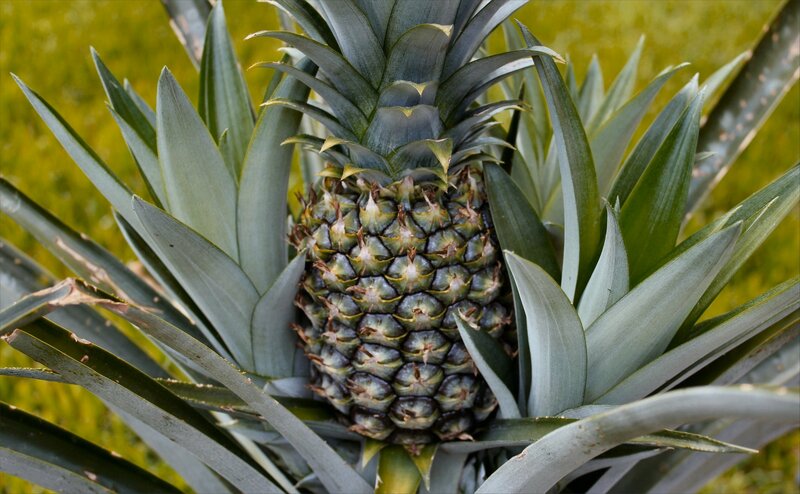 The name may be redundant, since both words mean “pineapple”, but as the mother of my future pineapple farm, she deserves a name so nice you say it twice. Click on the photo for a close up, then hit the “back” arrow to return to the post. This week, the stalk supporting her is growing taller, and the “buds” for future shoots are starting to bulge from the stalk. 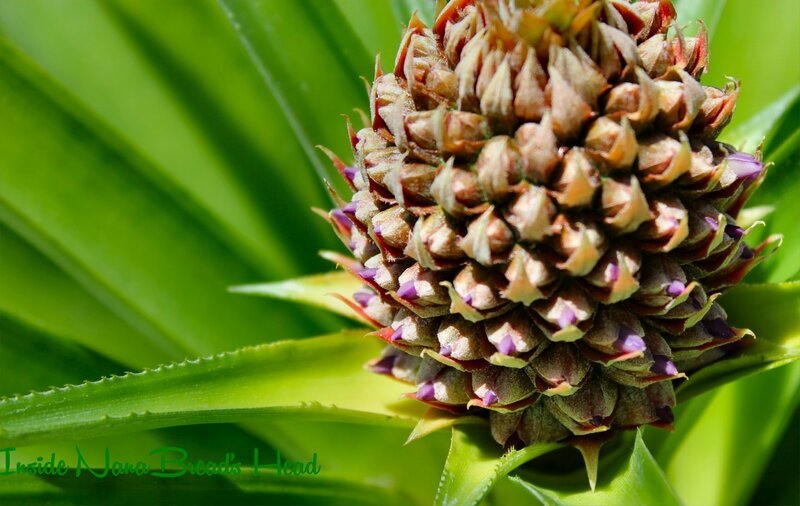 There are three of them, and according to the Hawaiian Ag Site, we will need to cut some of them away in order to promote the growth of a second pineapple fruit (known as a ratoon). 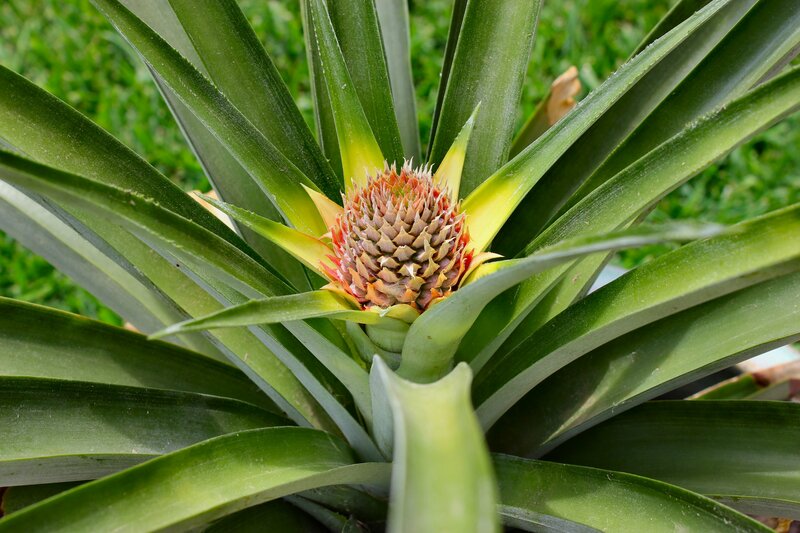 The good news is that those shoots, called suckers, can be planted to create new pineapple plants. 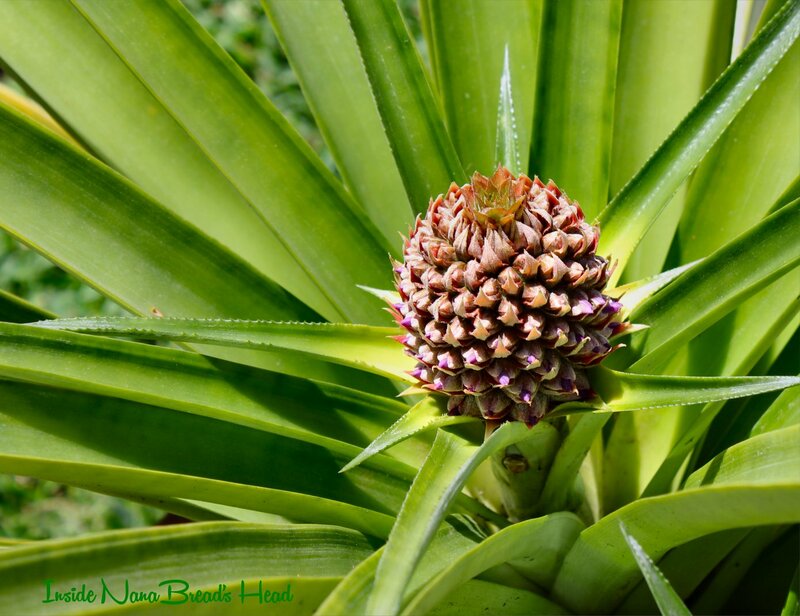 The biggest news of the week is the flowers that are starting to bloom from the base of the pineapple. A few rows of these purple/blue flowers should gradually bloom over the next 2 weeks. Once they die back, the fruit begins to flourish and eventually ripen. I can’t wait to see how she progresses! On a separate note, we thoroughly enjoyed the pineapple I received from the kids on Mother’s Day. You know… the one I used to punk readers into thinking the baby was fully grown? Well, I made sweet & sour chicken for dinner last night with big chunks of my Mother’s Day pineapple, and it was delicious. The good news, however, is that we planted the top and started a new pineapple plant. One’s a novelty, but two’s a farm. I think I will call this one Spike. I’m just messing with you. That’s the pineapple I got for Mother’s Day. Sorry. Here are the actual photos or our little sugarbaby. Unaltered, I promise! You know, we’re going to have to find a name for him/her soon so I can quit calling it Him/Her. I think a baby pineapple naming contest may be in order. Readers could submit potential names, then vote for a favorite. What do you think? Should we name the baby pineapple? Six years. 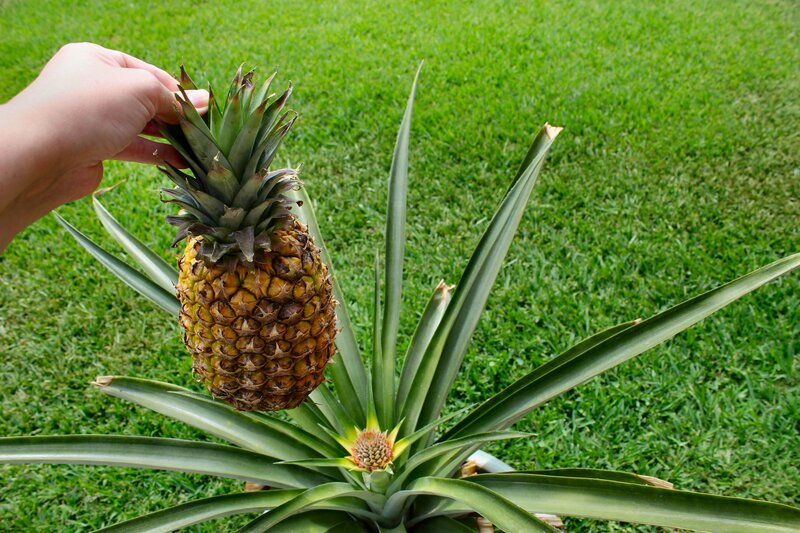 That’s how long it has been since I lopped the top off a fresh pineapple and planted it in the ground. 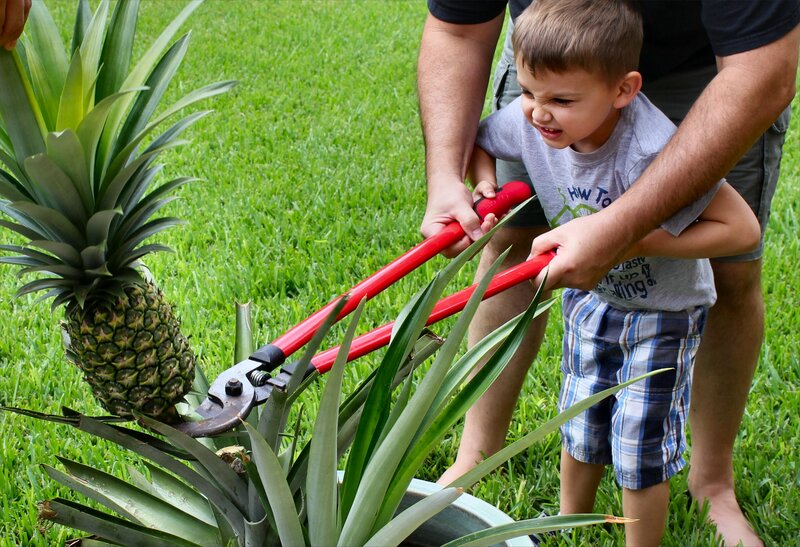 For six years, I’ve dreamed of eating pineapple grown with my own two hands. It’s not an impossible dream. Remember… I live in Houston, and we’re considered a sub-tropical zone. I grow bananas in my back yard. 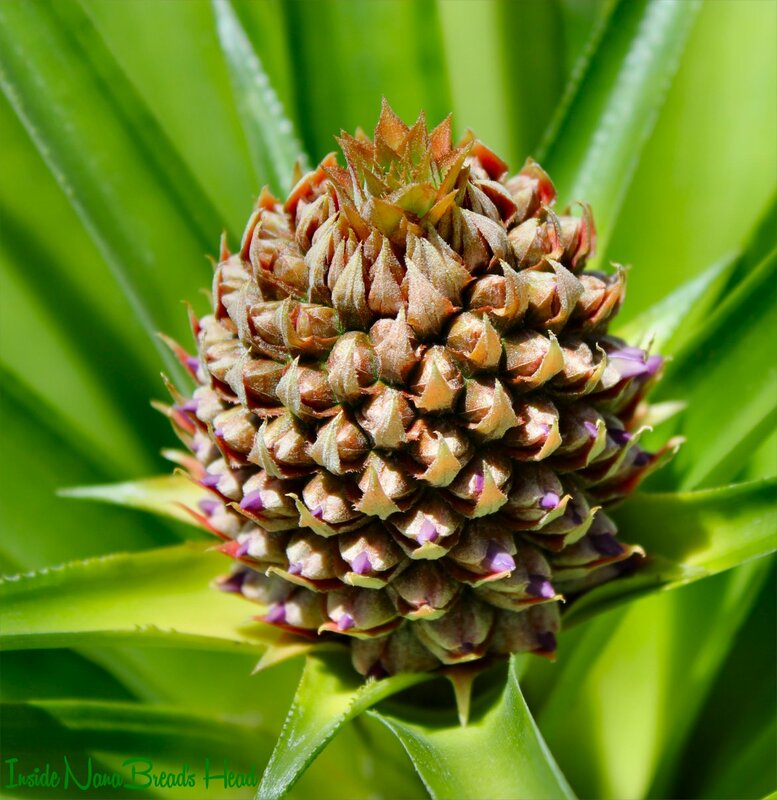 It shouldn’t be a stretch to grow a pineapple. Logistically. I have a special relationship with my pineapple plant. I’ve nurtured and protected it for six long years. I’ve babied it. I’ve watered it. I’ve even moved it inside when temperatures dipped close to freezing and wrapped it in a warm blanket. 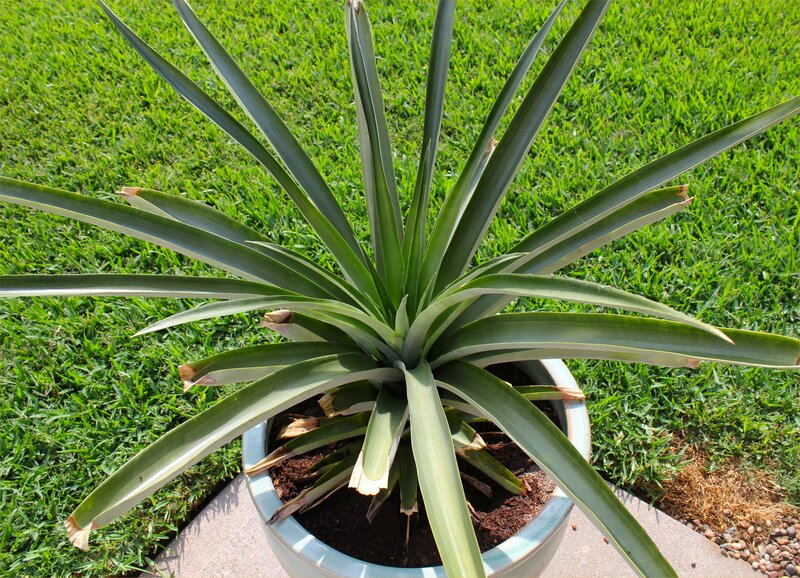 I’ve treated my pineapple plant better than some people treat their pets (shame on them, by the way). I also talk to my pineapple plant. 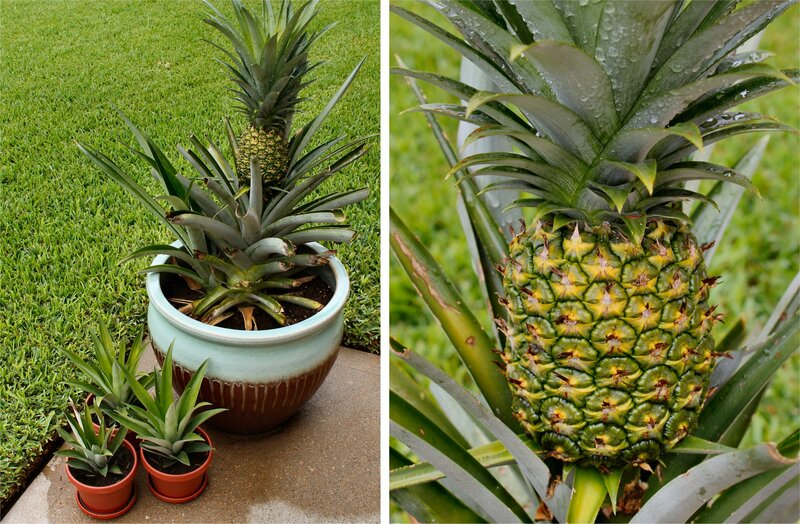 In the beginning, it was “Good morning, pineapple plant!” After a few years, it was “Lookin’ good!” But for the past year, it has been “I want my baby pineapple!” Someone (me, I guess) failed to tell my pineapple plant that the average wait time – from planting to producing – is about 20 months. That’s what the Ag Department for the state of Hawaii says. 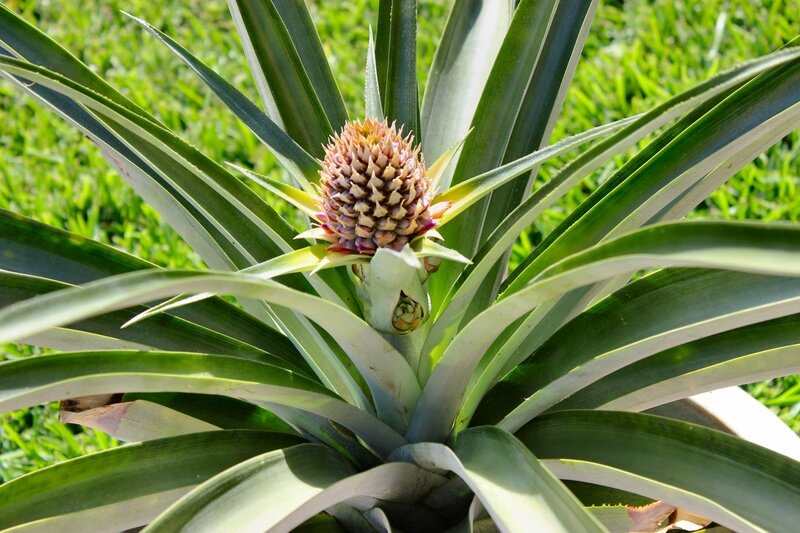 And when held to the Hawaiian standard, my pineapple plant is a late bloomer. A very late bloomer. I’ll be posting occasional photos as our baby grows. If you’re a pineapple expert and this bloom is NOT a baby pineapple, please feel free to leave a comment telling me I’m an idiot. It won’t be the first time. Or even the second. But until then, I remain eternally optimistic.